The phenomenon started right here in the Carolinas and gained considerable media coverage. It then started to spread to other southern states. Next came areas in the northeast. Soon it spread to states in the heartland. Now, this crazy occurrence has reached my hometown of Spokane! These creepy clowns are getting out of control!! Creepy clowns like these are popping up all around the country. Well, I am not as panicked as some people. Actually, far from it. I have followed as many of these sightings as possible with interest and curiosity. I know you might think I am a bit twisted but I am fascinated by these clowns. As someone who loves haunted houses, scary movies, and the paranormal, this is right down by alley. But guess what? 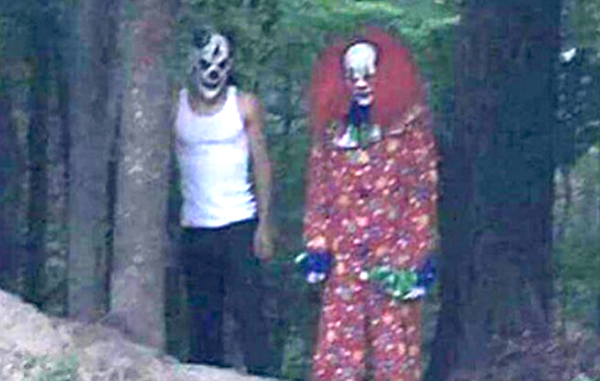 These clown sightings aren’t something completely unique to 2016. Remember two years ago when menacing looking Bozos started popping up in a few different places across the country? I sure did because I wrote about it. But while random intimidating clowns lurking around the streets isn’t a new concept, the degree to which it is happening in 2016 is a whole different circus than what happened two years ago. Weapon wielding scary people in face paint and crazy wigs is a major thing right now. This “trend” (for lack of a better word) has reached mainstream America as citizens from all corners of the country have heard about clown sightings in their local communities. Let me be frank about this. Because I am a little demented in the head, I love the idea of scary clowns walking around in the dark. I have enjoyed all the parody videos and photoshopped images that have come out poking fun at the trend. I have laughed way too much at the #IfISeeAClown tweets and memes. I have watched countless local news packages from stations across the country reporting on their own clown sightings. However, I certainly don’t approve of clowns engaging in violent activity (hasn’t happened yet) and I don’t approve of people making calls to the police reporting fake clown sightings (has happened a lot). My hope is that as a society we can have fun with this while not making it destructive. Clowns who chase children or cause harm to anyone should be thrown in prison for a long time. My hope is that after Halloween this clown phenomenon dies down. Although I am entertained by it, there comes a time when enough is enough. Just like having Christmas lights still up well past the holidays is weird, having clowns running around during Thanksgiving just doesn’t fit either. My other hope is that a documentary is made chronicling the clown sightings along with information on who/what was responsible for starting/maintaining such a bizarre trend. If you enjoy dressing up as an evil clown, please know that you impact everyone from children to law enforcement to actual professional clowns. Make good decisions and realize potential consequences. These days, we all have reason to be vigilant and concerned about things that seem out of place. Don’t Blink. This entry was posted in Uncategorized and tagged creepy clowns by brent. Bookmark the permalink.